It’s two years since the Bank of Japan cranked up yen-printing in a bid to lift annual price rises to 2 pct in “about two years”. But with companies and consumers refusing to spend the stimulus – and oil cheaper – inflation is at zero. The BOJ needs to think beyond bond-buying. 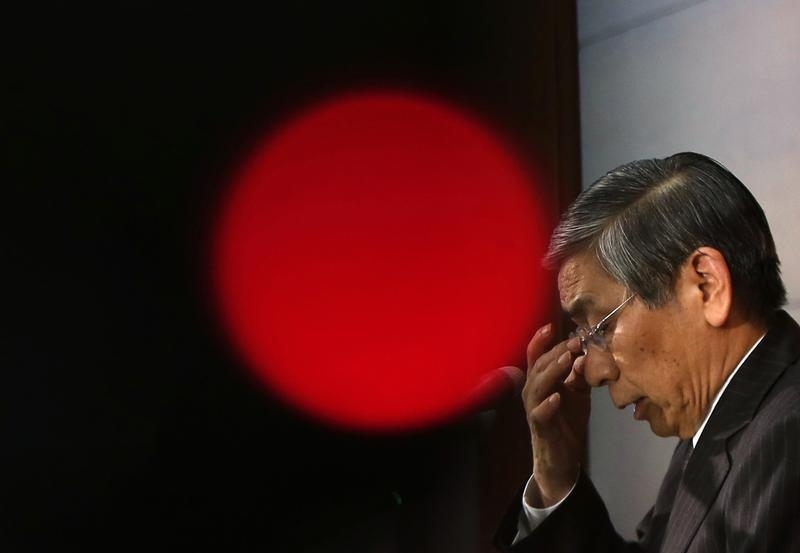 Bank of Japan (BOJ) Governor Haruhiko Kuroda touches his glasses during a news conference at the BOJ headquarters in Tokyo December 19, 2014. One of the architects of Japanese Prime Minister Shinzo Abe’s “Abenomics” campaign on April 1 called on the Bank of Japan to take more action to end deflation when it meets on April 30. According to the BOJ’s current plan, the central bank would boost its holdings of Japanese government bonds by 80 trillion yen ($666 billion) a year, compared with 50 trillion yen earlier. Japan’s annual core consumer inflation ground to a halt in February, the first time it has stopped rising in nearly two years.